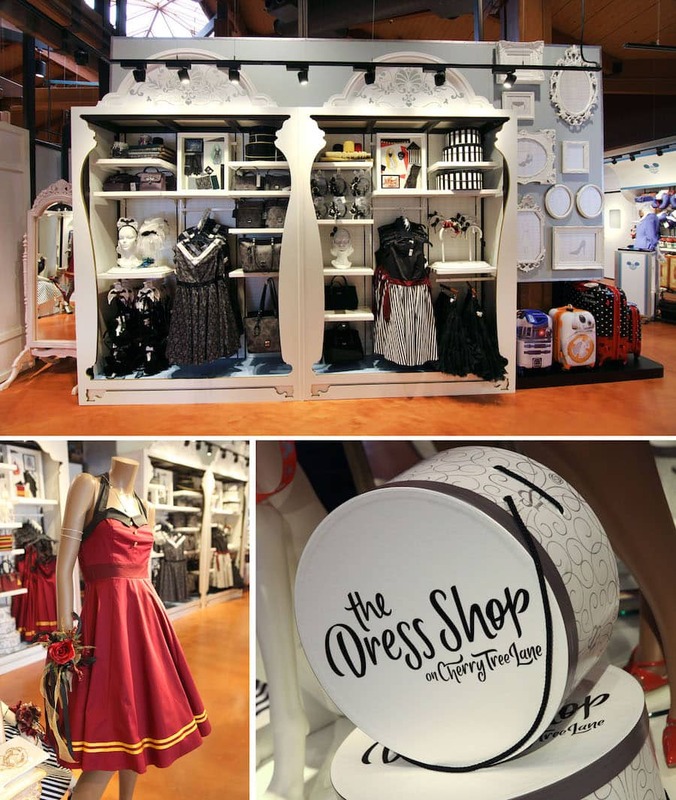 The Dress Shop, a delightful apparel and accessories collection created especially for Disney Parks, returns to Cherry Tree Lane in the Marketplace Co-Op at Disney Springs on July 27. First introduced in spring, this whimsical collection is filled with nostalgia that fans of Disney Parks will love. 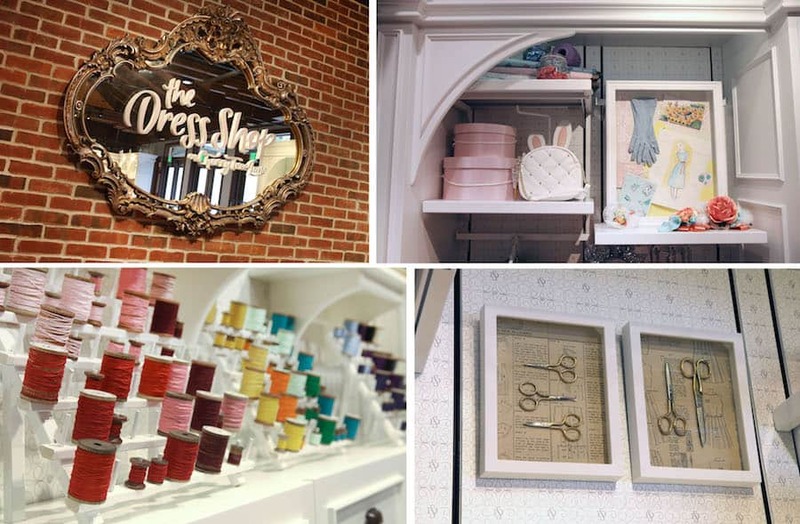 I recently caught up with David Soliman, area manager for merchandise presentation at Disney Springs, to learn how his team created the shop-within-a-shop at the popular accessories boutique. The merchandise presentation team spent several months planning and designing the overlay. Installation took about a week once display items and visual graphics were fabricated. Mariana Martinez, a graphic designer with the Creative Services team, partnered with the team to develop a “Dress Shop” monogram that is incorporated throughout the area. Mariana also provided black and white sketches of dresses for shadowboxes used in displays. These sketches were then colored and added to a collage of items including fabric trimmings shared by the product development team, adornments, and other Disney artwork. Other little details include spools of thread, antique scissors, vintage dress patterns, and a gorgeous mirror complete with the shop’s logo. Once The Dress Shop returns, guests will find the ten original dresses inspired by the Orange Bird, Walt Disney’s Enchanted Tiki Room, the Haunted Mansion, and more. 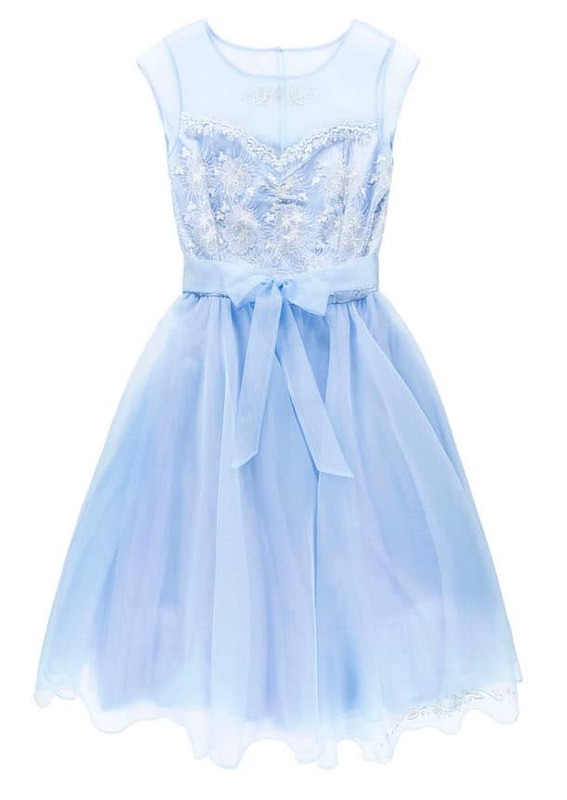 We are also introducing a new Cinderella-inspired dress that contains metallic embroidery. Look for these items at Disney Springs starting July 27. 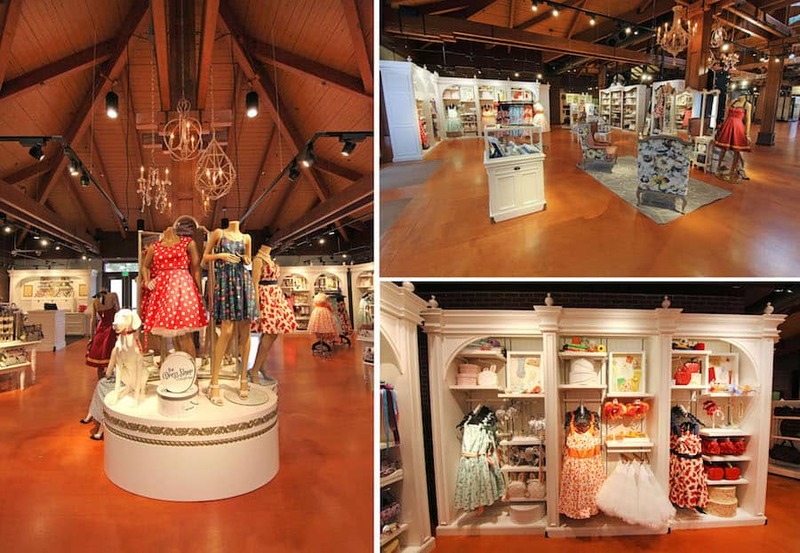 Guests will also find The Dress Shop collection in Vault 28 at Downtown Disney District at Disneyland Resort. Will the shop take phone orders? Also, will this be a permanent fixture? I won’t be at the park until September and would love one of these dresses, if the shop is still there. I too would like to see these available in the app. They were out of most styles when I was there mid-June. I guess I can hope they restock right before my December 6-10 trip! Please make these available to the public on the Shop Disney Parks app and/or the Disney Store site! I have badly wanted several of these dresses since they were released, and cannot get one without paying resellers a higher price for dresses I am not even sure will fit. 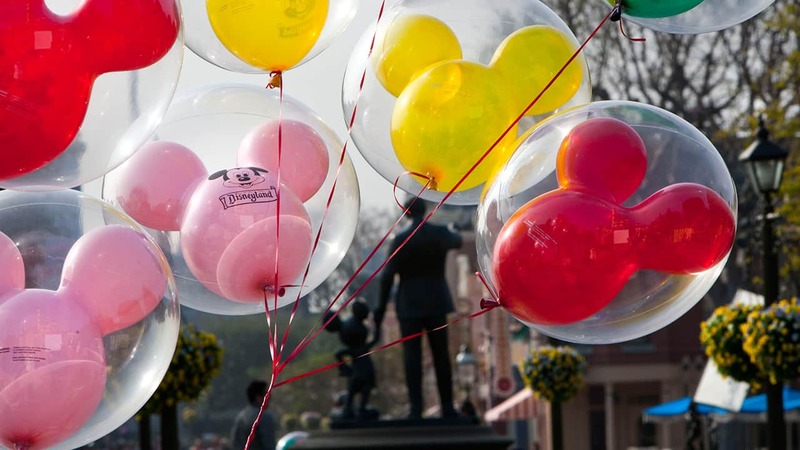 I am not fortunate enough to be going to the parks this year. I wish they would just make this a permanent store front in Disney Springs, you know it will do good. I just wish the items were available in the Shop Disney Parks app. I hope they’ll be there in sept! I really want one! I second Sarah’s question about the phone orders- will these be available to purchase by phone- and if so can we have the SKU information? I am hoping someday dress designers and retailers will realize the potential of these styles. They are timeless because these designers enhance womanly, feminine figures! Please make these beautiful dresses available for phone orders! As expected, these beautiful dresses are showing up on auction site at double and triple their cost. PLEASE make them available on app and consider a permanent storefront. How long is the Dress Shop expected to be open? I won’t be there till Mid-November. Thank you! @Tracy – From my understanding, these items will be coming to online store and Shop Disney Parks app in the coming weeks. I don’t have a confirmed release date at this point. The location continues to be offered at Marketplace Co-Op in Disney Springs. The app currently has 3 dresses on it, but are in-store purchase only. Any chance we could get a “Christmas in July” gift and have them released for mail order purchase? Please, I’ve been good all year! @Joshua – We had additional orders arrive for a variety of dresses such as the one inspired by Walt Disney’s Enchanted Tiki Room. Anytime there are more dresses, I am all in! Mix and Match with the awesome purses, I am good to go! I agree get them on the app, put them on the store website in limited periods too. Thanks for the fun and exciting news. How long will it be there? And when will it be back? @Lisa – The Dress Shop continues to be offered at the Marketplace Co-Op. I was at the location yesterday where I saw plenty of options. Love these dresses! Keep them coming 🙂 I also noticed there’s a new dress in the window. Any updates on the Christmas releases? @Natalie – I don’t have confirmed details at this point but I’ll share on Disney Parks Blog once I get additional information. Disney dresses oh my! After reading about this store i was so excited. Came from Australia for 10 days in wdw…no dresses. Hyped up and now ebay sells them for triple. Disney needs to make these dresses available to all to stop others from making a profit over the retail price. Add my vote for an app!! Why is the only reply to Joshua’s critical comment? Will these dresses be restocked and available on the app? Thank you. @Tracy – My apologies for the delay. The dresses will be coming to Shop Disney Parks app in the coming weeks. I do not have an exact release date at this point. I really hope they are in stock when I am at Disney World next week. I REALLY want one and it is the only reason I am even going to go to Disney Springs. Went to the shop in May, the Haunted Mansion dress was the only item my 17 year old wanted and all that was left was larger sizes. Any update on timing to purchase online or by app? Yesterday, I visited Downtown Disney’s Vault to buy the Pirates of the Caribbean dress and was told that they would be closing at the end of the month. ARE there any plans to have another store carry the Dress Shoppe Collectiion? I LOVE THE dresses. Any word on dress availability online? Most of them are only available in plus sizes in store with no word on restocking…. Looking for the tiki bird dress in medium! Thanks. Disappointed AGAIN!!! Just saw that the dresses are available online and the Haunted Mansion dress that my daughter cried when it was out of stock in May, is still not available in her size. And most sizes are not available. Seriously. Sorry for the rant but it is very frustrating. Sorry I meant the Hollywood Tower of Terror dress. Michelle, keep checking the website. It’s available in size small as of 5 minutes ago. Good luck! 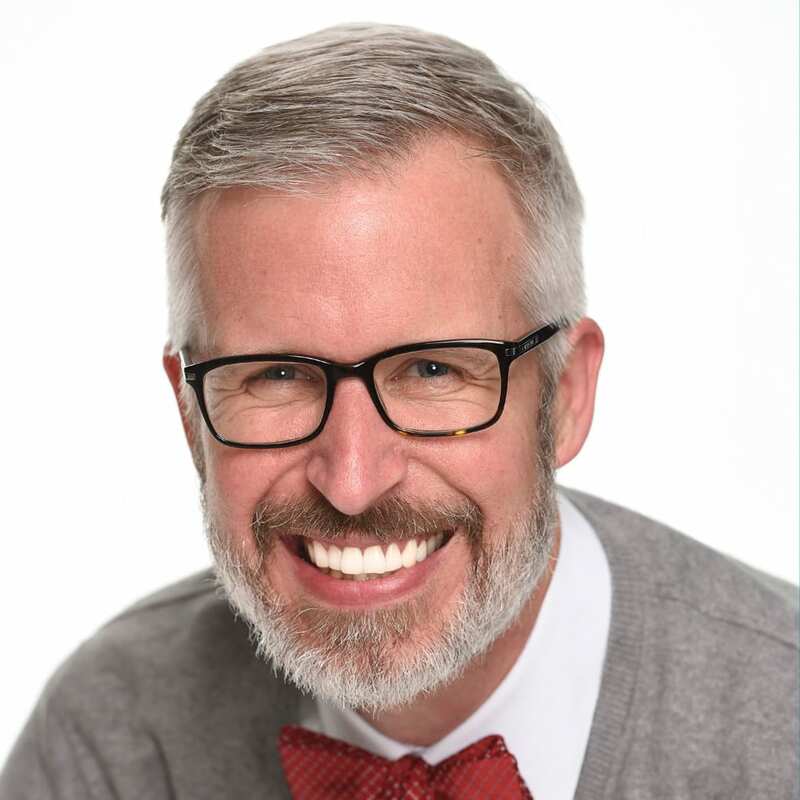 Can you purchase online? If so what is the website? Some Dress Shop items are still available on the Disney Store website. HTH dress was available for just a few days. Maybe it will return. Hi Steven! I was at the dress shop about 2 weeks ago and saw the most AMAZING display in the “coming soon” case and I’m dying to know when it’ll be available! The cast member told me to check the blog for that info. Any chance you know when the Tightrope Walker dress may become available?